(March 8, 2016) – The World Taekwondo Federation (WTF) announced that Olympic athletes competing at Rio 2016 will wear different colored pants, representative of their national team color, for the very first time as part of the federation’s commitment to delivering a new and exciting spectator experience at the upcoming Olympic Games. Each WTF Member National Association will be allowed to choose one color, including white, which all of their athletes at Rio 2016 will compete in by April 30. This will not only ensure a whole new look of taekwondo competition at Rio 2016 – unique to the Games – but also allow the fans in the stadium and those watching from home to easily identify the athletes competing. The idea was developed by the WTF Technical Committee, which is responsible for identifying innovative ways that the WTF can continue to evolve and modernize the sport. New innovations have included the development of the instant replay system and the introduction of impact sensors in the body and head protectors – the latter a first at the Games in Rio. By embracing the very latest sports technologies, the WTF has ensured a fairer and more transparent competition and guaranteed that the ancient sport stays relevant to today’s modern audiences. 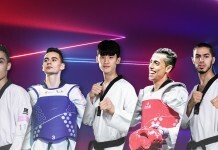 “With less than five months until the opening of the Olympic Games, excitement is really building ahead of what we hope will be taekwondo’s most exciting Games yet. The introduction of colored pants for athletes will transform the look of competition, adding to the vibrant, carnival atmosphere in Rio, and will give athletes an even greater sense of national pride as they compete for their countries. The WTF is working closely with Rio 2016 to develop its sport presentation package which will increase engagement with fans inside and outside of the stadium during the Games. As well as looking at bringing in taekwondo and para-taekwondo demonstrations between sessions, the WTF is looking at innovative ways of leveraging Brazil’s rich culture to keep fans engaged during breaks in play.